The family of the man who former New England Patriots star Aaron Hernandez was convicted of murdering is asking the NFL team to voluntarily pay damages — potentially millions of dollars — as part of a wrongful death lawsuit. "That would be the right thing to do," family attorney Douglas Sheff told reporters Friday, standing with Ursula Ward, the mother of slain semi-pro football player Odin Lloyd. "That would make the Patriots Ursula Ward's champion," he added. Sheff couldn't say how much he would want the team to pay, but the unexpected suicide of Hernandez in his Massachusetts prison cell on Wednesday has thrown the legal process in flux. 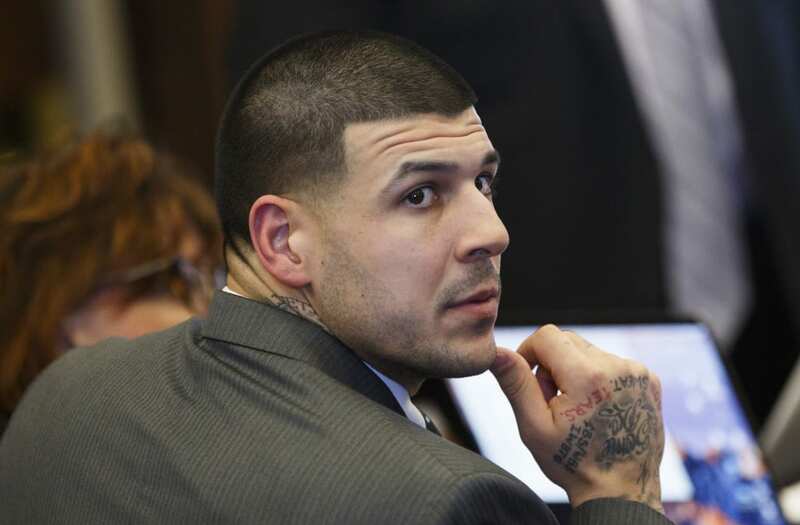 Hernandez had been serving a life sentence for murder in the June 2013 shooting death of Lloyd — his friend and a member of the Boston Bandits. Hernandez — a tight end for the Patriots from 2010 to 2012 — signed a $40 million contract before he was dropped by the team after his arrest. A jury convicted him in 2015. But his case was in the middle of an appeal review by the state Supreme Judicial Court, and there was the potential that his guilty finding could have been overturned. His death, however, essentially leaves it unresolved — so the state could move to void his conviction entirely. It's a legal loophole known as "abatement ab initio," or "from the beginning." Hernandez's appellate attorney, John Thompson, told the Boston Globe on Wednesday that he expected to file the appropriate paperwork to make that happen. If Hernandez was never technically guilty of murder, then he — or his estate — could potentially be owed money from his contract that was unpaid. Reports have suggested that amount could be around $6 million, accounting for his signing bonus and salary at the time of his arrest. Meanwhile, Sheff said he is still in the process of determining how much in assets Hernandez was worth, including a Hummer and his home in North Attleborough, Massachusetts. Hernandez also leaves behind a fiancée and 4-year-old daughter, and it's unclear what financial arrangement he may have had with them. Regardless, Sheff said, Lloyd's family deserves some compensation for their suffering. His mother told reporters that she would like to use such money toward scholarships under her son's name. Ward also said her desire for justice isn't about reaping a windfall. "I lost my best friend. I lost my son. I lost the love of my life," she said. "There's no amount of money in the world that can bring Odin back. None." The state medical examiner's office on Thursday ruled Hernandez's death a suicide after he was found hanged by a bed sheet in his single cell at the Souza-Baranowski Correctional Center. His attorney, Jose Baez, said was he was not on suicide watch. His family is donating his brain to science to help research brain trauma.